Last year I uploaded a series of printable cards for communicating dietary restrictions in Japan. This is a follow-up of sorts to this, with some information about food package labelling and allergy-causing products. 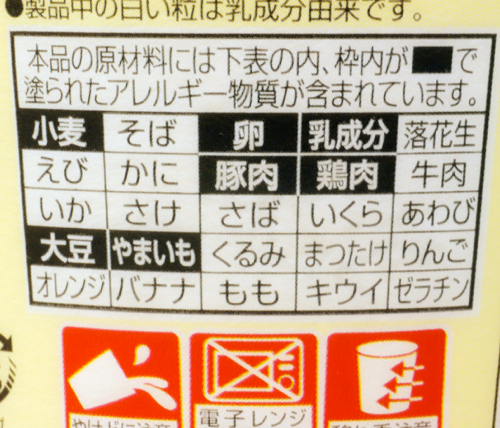 There are 7 substances that must, by law, be indicated as being present on packaged foods that contain them in Japan. I've listed them below in this order: English: kanji: hiragana or katakana: roma-ji. Dairy : 乳 : にゅう : nyuu (For dairy products, look for that character 乳　since it's usually used together with other kanji, e.g.乳製品 for 'dairy products'. Wheat : 小麦 : こむぎ : komugi. Again look for the 小麦 part. Wheat flour for instance is 小麦粉. Then there are 18 other food substances that are recommended to be indicated if they're present. About oranges - I do wonder if it includes satsuma and clementines and mandarins and such, which are called oranges in the west but are called 蜜柑 - mikan - in Japan. I guess logically it should. 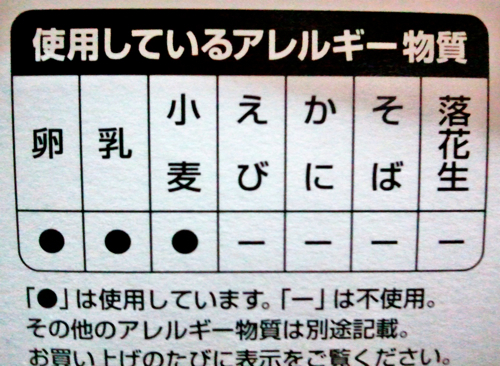 Anyway, if you are allergic to oranges including the 'mikan' kind watch out for the オレンジ label. The one below shows all 25 substances in a grid, with the ones that are in the product indicated in black. I think this one makes more sense and would like to see it standardized. The point is to always look for the words that indicate whatever you are allergic to, even if your personal Kryptonite is not included in the substances listed above. And when in doubt, pull out one of your allergy-communicator cards and ask someone. Just pointing to a package, then showing your card, and saying, "OK?" with a helpless look on your face will be enough, I promise. Many people in Japan are quite happy with helping hapless visitors. If you can read Japanese, there's an informative PDF on the Japanese government's Consumer Affairs Agency (消費者庁) site about allergy-causing food labeling: link to PDF. See also: my related Quora answer here for a couple more labels. Submitted by maki on 2013-05-14 21:16. Thanks a lot for this list. This will help me shopping in Japanese :) But I miss one substance. onions or leek, lots of people, me included, get a stomachache etc. from eating anything in the onion family. Could you throw a couple of kanji/hiragana for the onion species into the mix, please. A round bulb onion is 玉ねぎ. Alliums in general incliuding green onions and leeks are ねぎ or 葱　or ネギ　(negi). Well, no, it doesn't, but it DOES make Japanese Kawaii Obligatory Mascot sense. At any rate, at least he's on our side! Completely unrelated but I finally purchased your book last week! 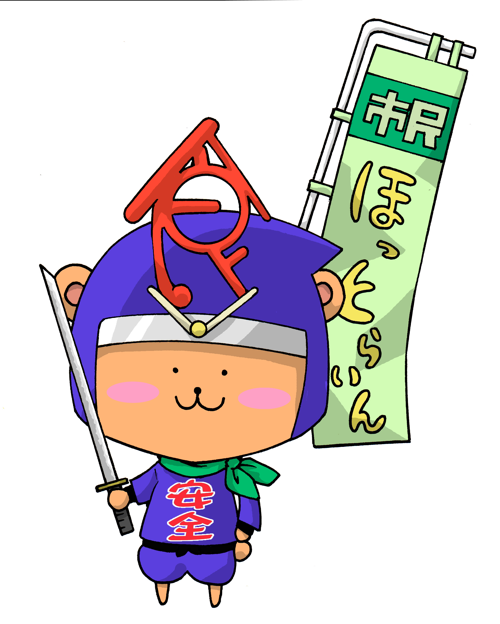 The mascot has a nose and mouth like a cat, but ears and tail like a bear. So I'm guessing bear. Thank you, thank you! This is much appreciated. I shop at a Japanese store here in the US often - while they have translated labels, they are not always accurate, and I like to be able to check the Japanese as well. Mitsuwa (my local Japanese store) has started putting out "gluten free" tags which I found was interesting - is the "gluten free" market picking up in Japan too? As a celiac, I love that I can add to the variation in my diet with many rice-based and soy-based Japanese foods. I was getting pretty good at picking them out before the tagging started but its nice that they are offering these things. Hrm.. When I first moved to Japan I used to write home telling my family it was like I was stuck in Mitsuwa and all the exits had disappeared! Nowadays, I wish I was locked in Mitsuwa.. My kanji knowledge has grown and I am able to shop comfortably at the grocery store but as of yet, I haven't seen much GF labeling outside of the specialty health store where they import GF products similar to those that I assume are sold at stores like Whole Foods and Trader Joes. What you are seeing is probably due to western product demand and is not geared to a Japanese consumer. BUT! If you want to come to Japan, please do! Only I suggest bringing your own GF soy sauce and avoiding many of the teas unless you know for certain that it is just green or black. Many teas here contain mugicha or barley tea. Delicious but celiac no-no. The main reason why there is not such a focus on wheat gluten allergies is that by the numbers, there are not as many people who are actually allergic to wheat gluten in Japan as there seems to be in western countries. This may have to do with the amount of bread eaten overall. As you can see from the charts, there are other substances listed such as specific seafood products which don't get mentioned much in the U.S.
GF soy sauce is not common because soy sauce is inhererently made with some wheat, but these days it's easier to get them from mailorder places, such as kenko.com. They even have a soy sauce made from quinoa: http://www.kenko.com/product/item/itm_7522524072.html 100% soy bean tamari is more widely available. Thank you so much for those! Even kiwi and buckwheat have their own place - wow. Those are never labeled in USA, and I wish they were. Do you happen to know if there is a common name for all tree nuts besides walnuts? Or they would always be listed by their own name anyway? Nuts are usually called as a whole ナッツ　- nattsu, but on allergy and ingredient listings you'll usually see the name of the actual nut. Thank you for this. My mom often sends me Japanese foods and while I don't let my allergic daughter eat them, I always make sure they don't contain her allergens anyway. But I always wonder if they are translated correctly. I wish they would label for chestnut as well. From what I understand, people with tree nut allergies can react to it as well and chestnut is pretty common in Japanese sweets. Thanks for this useful post! I wonder, since I have coeliac disease if it's just the wheat that is labeled in Japan. I've been in Japan before and had a great time but most of the time I didn't trust my own Japanese to suffice and also had a hard time with my translation cards. I cant eat wheat, oats, barley or rye, but since I do eat soy sauce the 'cards' often didn't say enough. The other ingredients you mention should be on the general ingredient list. In practical terms the one substance to be wary of from that list besides wheat would be barley. Rye and oats aren't used much except in obvious ways, e.g. oatmeal or pumpernickel. Look for the kanji character 麦 (mugi) which is part of many grains, e.g. 小麦　- wheat, 麦　or 大麦　- barley, ライ麦　- rye. 燕麦 - oats. This is very helpful. I'm allergic to shellfish, and since shrimp and crab are fairly common ingredients (and might not be easily visible in some products) it's been making me nervous about trying anything. Now I have a good idea of what to look for. Thank you! What about brown rice? I know genmaicha is made with it, but I assume some other foods would be as well, and I'm very allergic to brown rice, but not white.